As part of an initiative led by Marine Corps Commandant General Robert Neller, Marine Corps Systems Command (SYSCOM) is working on new technologies that will make Marines lighter and more efficient on the battlefield. Initially, SYSCOM will take the needs of Marines in six MOSs (rifleman, LAV crewman, machine gunner, mortarman, infantry assaultman, and infantry unit leader) into account. According to Brigadier General Joseph Shrader, head of Marine Corps Systems Command, the goal is to select new technologies to test, and potentially put into the field, during the 2017 fiscal year, which begins October 1. "I'm a bowhunter. I have a pack I put my bow in. It's designed for that specific purpose: to carry my bow, carry all my gear," Shrader said. "So that's the idea. If a Marine is a machine gunner, he goes down to supply to get his gear, and he gets the machine gunner's version of the pack, if you will, or maybe some things that we put on it to modify it so he can carry the tripod." 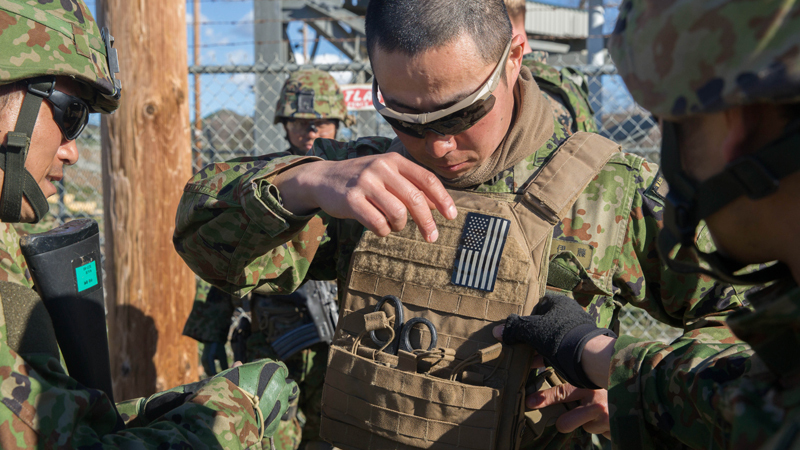 Soldiers of the Japan Ground Self-Defense Force's Western Army Infantry Regiment Scout Sniper program assist a fellow soldier as he tries on a U.S. Marine Corps flak jacket Marine Corps Base Camp Pendleton, California, February 1, 2016. — (USMC photo by Lance Corporal Timothy Valero).